So, what do you do on a holiday? It’s Labor Day here in the U.S., and the Phoenix lander on Mars is just watching the clouds go by across the Martian sky. This movie clip consists of 10 frames taken over a 10 minutes period by the Surface Stereo Imager on the lander. The images were actually taken on Sol 94 (August 29 here on Earth) at 2:52 to 3:02 local time at the Phoenix landing site on Mars northern polar region. Scientists say particles of water-ice make up these clouds, like ice-crystal cirrus clouds on Earth. Ice hazes have been common at the Phoenix site in recent days. But, of course, Phoenix is still hard at work on Mars, and recent images downloaded from the lander show the doors have been opened on another tiny oven on the TEGA (Thermal and Evolved Gas Analyzer), oven #1, to bake another soil sample. 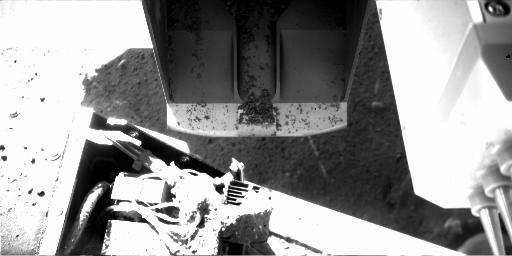 Other images of the scoop on the robotic arm shows soil inside on one image, and on a subsequent image, it looks as though the scoop has dumped the sample, perhaps inside the oven, or it may have been a test scoop and dumped out on the ground. The camera took the cloud images as part of a campaign by the Phoenix team to see clouds and track winds. The view is toward slightly west of due south, so the clouds are moving westward or west-northwestward. 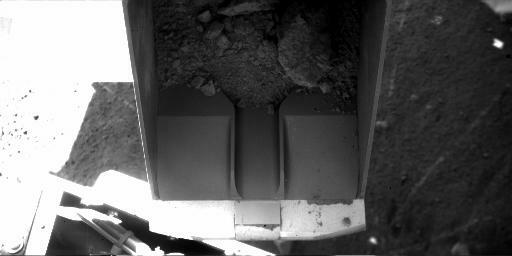 And here are the images from Sol 96 showing the open oven and the scoop with a sample of soil inside. Oven door #1 has been opened. Scoop with soil inside, and then dumped. Images are from Sol 96, or August 31, 2008. These cloud clips are superb. Kudos to NASA for them. We need more down to earth photos like that, Plus pictures from controversial shapes elsewhere. Empty scoop above an open cell. I wonder if they went for a dump, but haven’t gotten around to telling anybody yet (waiting final confirmation that the soil actually went in or some-such thing). I was just thinking how far we have come from the time of Giovanni Schiaparelli … and what are the ups and downs of information which we have found out about this neighbour of us.. It is just makes me feel so proud to be a Human…. Cheers to the whole Human Race and its advancements which made this beautiul movie…. This is nice but where is the movie clip? I thought Mars’ atmosphere was 100 times thinner than Earth’s? Why should we see clouds at all – was there a sandstorm in the vicintity? ….someday homesick Martian colonists will take time to just watch clouds go by…. The cloud clip is just amazing. It’s easy to imagine a blue sky with the white clouds blowing by. The is the first time the Phoenix mission has made Mars feel close and real. I’m sure I’ll have more complaints in the future – but for the moment, Thanks. This small clip is perhaps the most important to come from the surface of Mars. We already have many images of the tracks of Dust Devils, (caused by the base of thermals rising into the atmosphere), on the surface, but this shows us several additional influences. 1. There is water vapour in the atmosphere. 2. The atmosphere has a similar structure as Earths. 3. There must be a continuous flow of sublimed ice turning to water vapour at the surface. 4. Water vapour turns to ice during the night to form frost. We have seen this with Phoenix. So all the normal Earth like atmospheric activities continue on Mars. 5. Valleys, (a favourite subject of mine), must have a much higher water vapour content in their depths than the upper surface where all landers have so far been placed. We need to place a lander at the bottom of a valley so that we can see how the temperature might give conditions where life might exist at the bottom of the valley. And, we need to add a facility to float balloons up from the surface to calibrate the temperature of the atmosphere at different levels. As with the Earth, we might find much higher temperatures than expected. Interesting article. I like your observations Chris – certainly give something to think about. Besides that, I wonder if it’s just me or one of those clous in the clip looks a bit like a dolphin? Unbelievable! Are you realy realy sure that these pictures were not captured here on earth? Awesome! i agree – the image is exciting b/c it gives one a sense of what it might be like to stand on Mars and look up at the sky. can we please get a color camera next time!